I believe that technique, musicality/groove/feel are way more connected that many drummers seem to think. Many seem to talk about these two elements in an either/or context, as though technique is purely a physical matter and groove is purely a mental or spiritual matter. To take it a step farther, quite often when technique comes up in discussion, many are actually quick to knock it in order to talk about music as if they’re taking the high road. 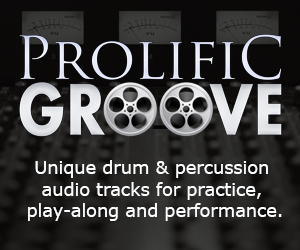 While groove and musicality are certainly the ultimate goal, technique is the means of getting there and I think we do ourselves a great disservice to discount this fact. In my opinion much of the relationship between technique and groove boils down to this: Nature & physics are perfect and constant, where as mankind is inherently flawed. The more we let the stick do the work for us, the more natural the musical flow. Conversely, the more input or influence we give the stick, the less the natural flow will speak through the instrument and the less groove. To put it another way, when there’s a lack of groove it’s usually caused by tension (or the player getting in the way of nature/physics). Slower tempos and less notes both tend to make this more obvious as there’s more space in which to detrimentally influence the stick’s motions. This is why the free stroke technique for consistent strokes and the Moeller whip and flop technique for accent/tap patterns are the most important techniques for a drumset player to know, they’re the loosest! At a recent drum clinic I had college students volunteer to play the most basic “Billy Jean” straight 8th drum groove for their peers. The first guy played it and it didn’t groove at all, the room was dead. After I offered him technique tips and guidance step by step such as loosening up on the sticks, playing a flowing Moeller whip style motion on the hi hat, using more arm and looseness in the left hand with rim shots the backbeat, etcetera, he absolutely nailed it. After a few bars I abruptly stopped him and made him look at his peers. They were all smiling and bobbing their heads--the groove came to life and everyone in the room felt the music. This was not a matter of being born with it, years of listening and being influenced by groovy music or a total mental reset, it was simply a change in technique that took all of about 4 minutes. With student after student the result was pretty much the same, wonderful! Now let’s look at the musical vocabulary within the groove. Music is made up of vocabulary which requires ability, and ability is ultimately a matter of technique. So, the better technique and more techniques you have at your disposal, the more musical options you will have. We drummers tend to like boxes, we want a simple one answer fits all technical approach and unfortunately that won’t work. As more musical options and ideas arise, more techniques will be required to execute them. And, the more techniques you develop, the more the musical options will arise. I’m certainly not recommending that anybody play busier just because they can, but the simple things will always sound better when a drummer chooses to play simply while having the ability to do so much more. That’s what the automotive world calls “headroom,” and you can always tell when a drummer has it or doesn’t. The ultimate goal is to have more than enough technique built up to make a wide variety of musical ideas easy to play with no groove-killing tension. Many drummers work harder and not smarter when they practice and then they wonder why they still tighten up while trying to play certain things, or why they just can’t play as fast as what they’re hearing in their head. It’s pretty much always a simple matter of technique. I can’t remember any student that when they first came to me didn’t play with extra tension in their hands to the detriment of their groove. Revamping your technique for looser hands and a better groove is often much easier than people think, I’ve had many students where even after 1-2 lessons they tell me they can feel a big difference. As their technique gets revamped they’re able to play longer with no fatigue or pain, draw a much more musical tone out of the drums, play louder without breaking sticks, heads & cymbals, and most importantly, groove harder! The more and better technique you have, the more music you can make, and the more natural and effortless the musical feel. Add great technique(s) to a carefree and joyful spirit, and there will be no bottom to the pocket! Bill Bachman is a world-renowned specialist in hand technique with a heavy background in rudimental drumming and its application to the drumset. Bachman is a regular contributing columnist for Modern Drummer magazine, author of the book Stick Technique: An Essential Guide for the Modern Drummer (Modern Drummer Publications) and the Logic marching percussion instructional series (Row-Loff Productions), and has produced several instructional DVDs, Reefed Beats and Rudimental Beats, and he is the inventor of the Remote Speedy Hat. Bill is the designer of Vic Firth’s Heavy Hitter pad series and signature Billy Club drumsticks, and the founder of DrumWorkout.com.